Not being an early riser we arrived at the markets most likely after all the good stuff had since been sold. 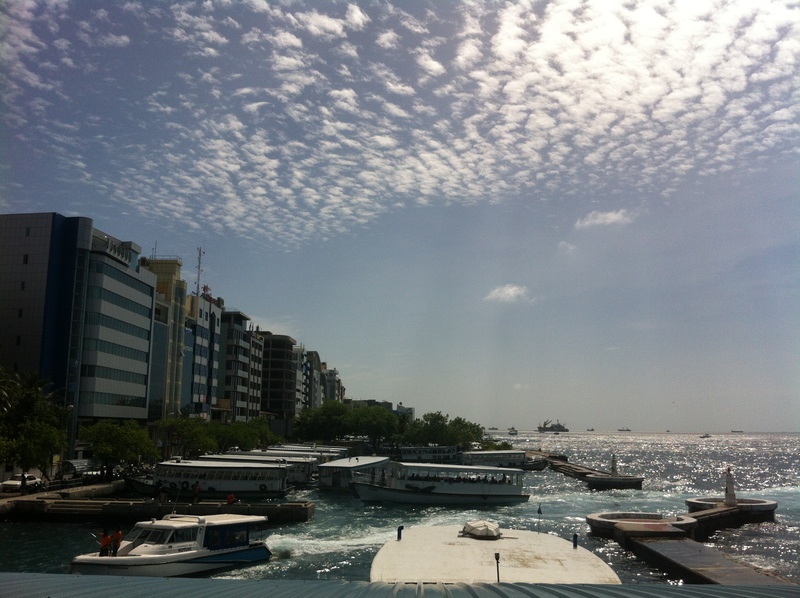 It was roughly lunchtime, the jetty being busy with local boats, tourists arriving and departing Male on day trips and the Coast Guard doing whatever it is the Coast Guard does. The ferry crossing was rather pleasant if not a little hot but that is normal here. We had experienced some extreme weather the week before with some ferries cancelled due to the high seas. Being able to go from one place to another irrespective of the weather is something you take for granted not being from a sea faring nation. “Smells like low tide…” ah yes, we must be nearing the fish markets! I always like visiting the local markets wherever I am working. It’s important to see what’s available and what the prices and quality is like. If you can get away with using local instead of imported and cutting down on the food miles then it is better do so for both the environment and the budget. I have to say that at first glance the fish markets were uninspiring at best. There was the inevitable smell, the sad looking dead octopus on the floor surrounded by flies and what I hope are the small sized rejects that didn’t get snapped up first thing in the morning. Mental note: get your arse out of bed earlier next time…! Most of what was on offer was Tuna along with some smaller herring type fish, a couple of fish that I am more used to seeing in an aquarium or voiced by Ellen DeGeneres on a particular kid’s film and a type of anchovy like sprat. 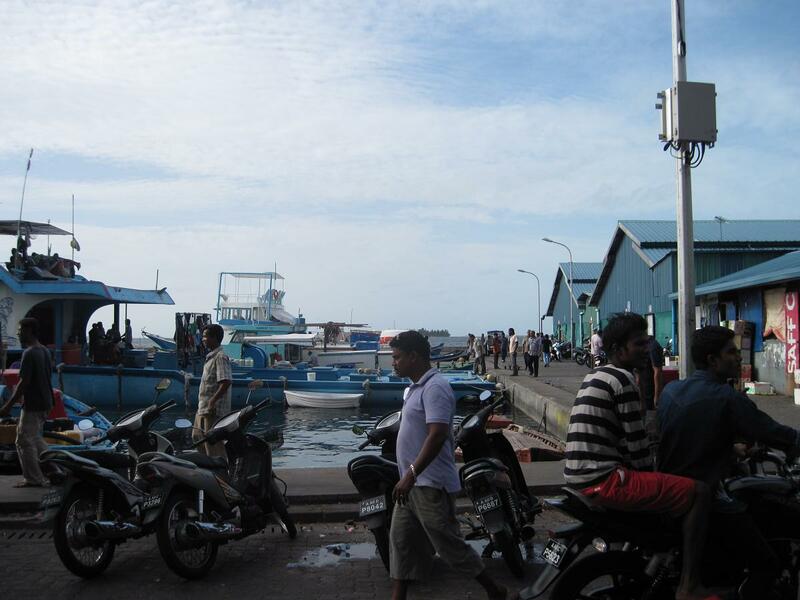 Tuna make up a significant proportion of the economy in the Maldives. Fish and coconuts are pretty much the only readily available resources here with fishing only being eclipsed in the economy by tourism about three decades ago. All the fishing in the Maldives is done by hand with either rods (modern or traditional) or hand lines; netting is forbidden. Which is really good news for the sustainability of the Tuna industry. 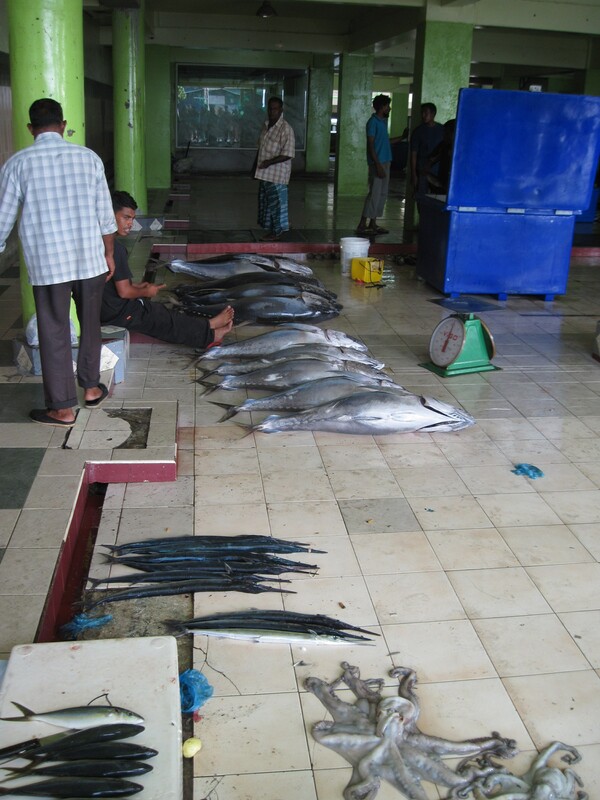 At first I was shocked at the sizes of some of the Tuna on display having previously worked in the Cook Islands and seen the monsters hauled into the kitchen on wheel barrows. 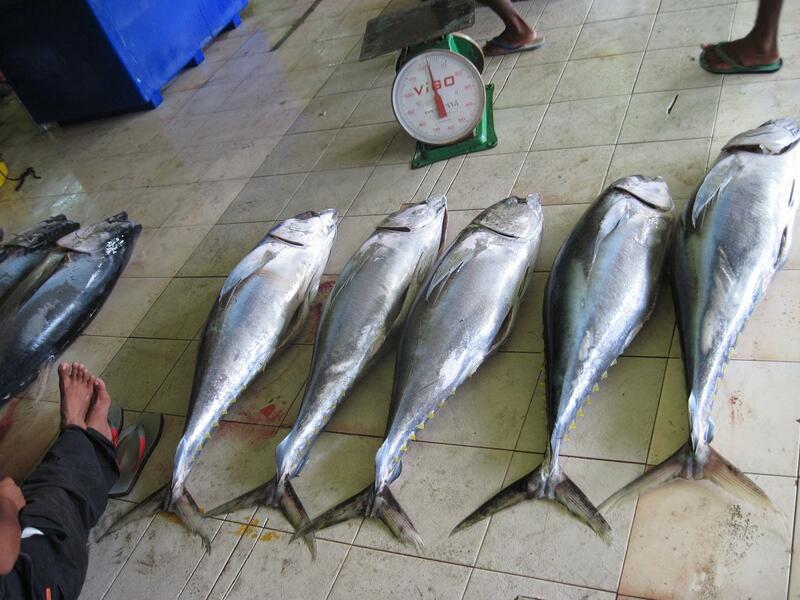 But it seems that a lot of what is caught are Skip Jack Tuna whose normal size is 1.5 to 5 kg, with an average 35cm fish coming in at about 3kg, although I am certain some of the fish I saw were suspect. 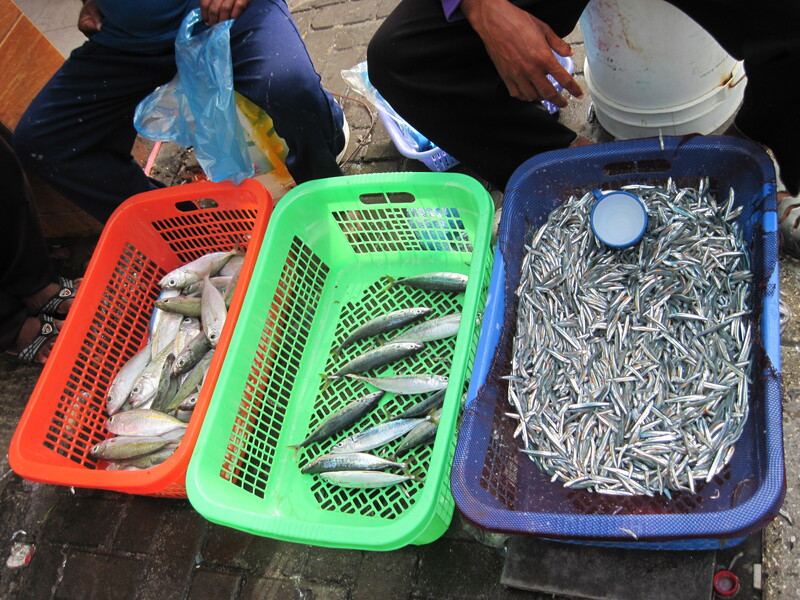 Skipjack tuna are a smaller variety than the endangered Blue Fin tuna. The problem is that juvenile Yellow Fin and Big Eye tuna swim with adult Skip Jack. Much of the Skip Jack fishing around the world is done with purse seine vessels which use large nets and catch indiscriminately like those in finding Nemo. (I have a 3yr old daughter so know that film well…!) What this does means is that as much as 30% of a catch is of the less common Tuna variety caught and killed before they have reached breeding age thus creating a bit of a vicious cycle of diminishing numbers. At the markets the quality of what was on offer was not the best. Although I’m sure it was fresh that day as there was no refrigeration it’s definitely not what I would exactly call sashimi grade. Tuna needs to be killed quickly and bled in order to produce a good quality product. This usually involves a spike to the brain. If death does not come quickly then the stress causes a build-up of lactic acid which results in a dull looking, greyish flesh instead of the nice bright colour we are used to. If the Tuna is not bled then you end up with an excessive blood line which is full of Mercury and not really fit to eat. 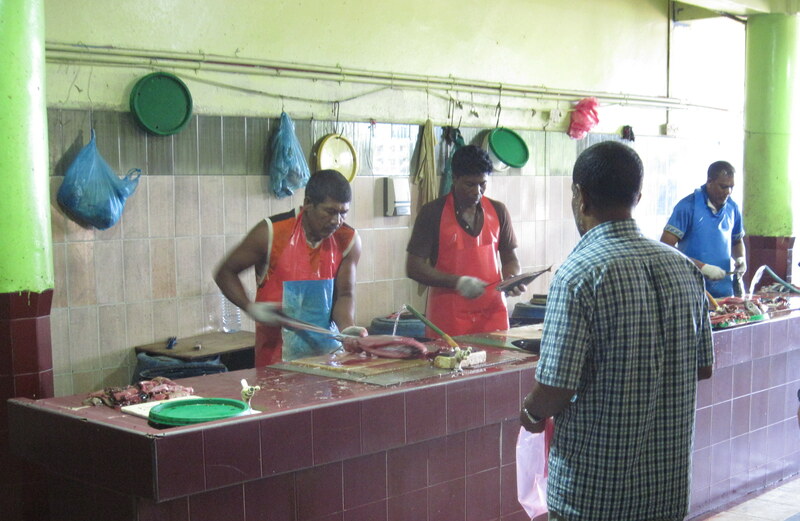 That said, how Tuna is prepared locally here is very different from how you would serve it back home. Instead of sashimi, or lightly seared or grilled most of it ends up in a curry or a traditional Maldivan spicy Tuna soup whose name eludes me but is not really my cup of tea anyway. If you did so choose to take a fish home then you could do so cheaply for about $3US per kg and have it wet filleted on the spot by some very fast and talented filleters. Maybe they are looking for a job…?